I just finished re-reading Christopher Browning’s classic book on an often overlooked part of the Holocaust in Poland, Ordinary Men: Reserve Police Battalion 101 and the Final Solution in Poland. As I read it I was reminded of Niebuhr’s words. The book details the actions of the men of a police unit that one would have expected to be the most unlikely perpetrators of violence and mass killing. Most of the unit’s men were not ardent Nazis or even party members, many were too old to have been drafted into the military, and most came of age long before the Nazis took control of the education system. They were mostly from Hamburg, one of the least Nazified of all major German cities, and included was a contingent from Luxembourg, a country that was not part of Germany. 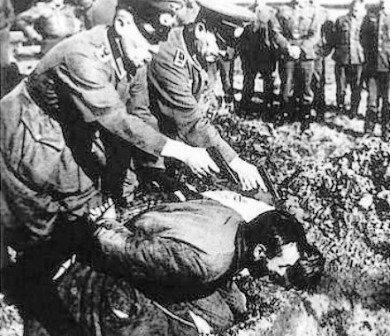 In their actions in Poland an estimated ten to twenty percent refused to take part in the mass killings of Jews. Unlike the people who manned the factory like death camps such as Treblinka and Auschwitz, these men killed their victims in an exceedingly personal manner. They stood at close range and fired pistol or rifle shots into the back of the skulls of their victims, who mostly were kneeling over pits or prostrate on the ground. The members of the unit killed a minimum of 38,000 Jews in this manner, and were instrumental in the deportations of about 45,000 more to the death camps. Very few were prosecuted for their crimes. Most went home, and some resumed successful careers in the police.